MVP Weddings was recently established in Fresno, California to serve engaged couples by creating a cinematic wedding video that tells their love story as art via cinema. 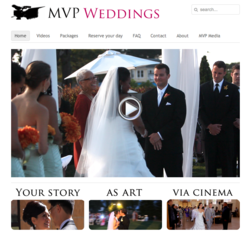 MVP Weddings, a company that provides wedding videography for couples, was recently established in Fresno, California. After eight years of video production experience in the San Francisco Bay Area, company owner Matt Martin relocated to Fresno and established MVP Weddings. MVP Weddings focuses on creating a cinematic experience that tells the engaged couple's love story within their wedding video. "Our goal is to combine the art of storytelling with beautiful principal photography and cinematic editing to create an engaging experience that doesn't just capture the day, it reflects the beauty and tells the story of the couple's relationship", states Matt Martin, the owner and Director of Photography for MVP Weddings. The company uses a variety of equipment such as large sensor HD cameras, Canon prime and zoom lenses, dollies, sliders, and steadicams to create a beautiful video experience. Couples can view sample videos, check to see if the company is available on their wedding date, reserve their date, customize wedding video packages, get instant price quotes, and pay for services on the company's website, mvp-weddings.com. Customer feedback has been positive. "[MVP Weddings] listens and produces, and made us look really good! We have a cherished wedding video we watch each anniversary!" writes Elizabeth Owens, of Clovis, California. "Edith and I just reviewed parts of the video and it looks incredible! ", writes Timothy Choi of the San Francisco Bay Area. " Thank you for your awesome work! We especially love how the wedding dance sections turned out - the timing to the dance moves fitting to the music? Wow! That was incredible work! Again, we love the wedding video and thank you for capturing our incredible moments from our special day." MVP Weddings creates beautiful wedding videos for couples that tell their love story artistically through cinema. The company tells the story of who the couple is, how they fell in love, and the beauty of their relationship. They want couples to be exceedingly pleased with the result. MVP Weddings is based in Fresno, California and provides wedding videography services throughout the Central Valley, Los Angeles, San Francisco, the greater California area, and is available for destination weddings.